Calcium Rich Rice, Biryani, Khichadi Recipes. Rice, to most Indians, is a comfort food -- a versatile cereal that soothes and satiates! Explore this section to discover a world of rice recipes, ranging from simple everyday dishes, to elaborate party fare, spanning not just Indian recipes like Khichdi, Pulao and Biryani but international favourites like baked rice dishes and risotto too. These scrumptious treats are loaded with calcium-rich ingredients like paneer, pulses and greens, which will definitely help you to build strong bones and teeth! When one thinks of homely food, khichdi is the first option that comes to mind. A wholesome khichdi amde with yellow mong dal can warm your heart and make you comfortable after a long and busy day, and this sumptuous Bajra Khichdi is sure to live up to your expectations. Rajasthanis use more of millets like bajra than rice, and therefore recipes like khichdi that are typically made with rice in other parts of the country are made differently in Rajasthan. Buckwheat is rich Magnesium and Calcium, its good for formation of bones and teeth. Calcium is a mineral that makes bones stay strong. The human body consistently remove small amounts of calcium from our bones and that has to be topped up with Calcium rich foods. Choose from our buckwheat khichdi or buckwheat moong and vegetable khichdi recipe. 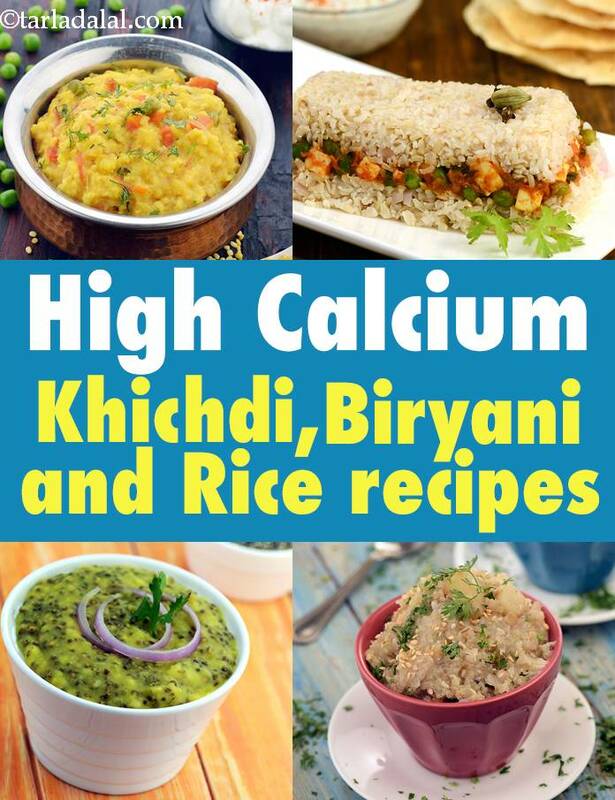 Enjoy our collection of Calcium Rich Rice, Biryani, Khichadi Recipes given below from Calcium Rich Breakfast to Desserts. Make this cheesy creamy delicacy with kid's all time favourite "rice' and watch your child dwell into this dish.